Spinach smoothie is so healthy and yummy. I make this smoothie for most of my breakfast, and it pushes me through the day. I do not need a mid-day snack after taking this; it keeps me full. 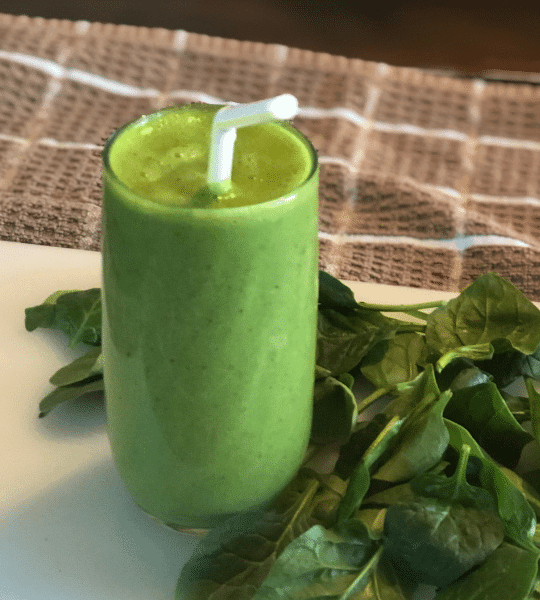 This spinach smoothie is vegan but you can substitute the cashew milk with any milk of your choice, and it will still be delicious. You can replace the sweetener for something else like maple syrup, stevia, agave or molasses. The benefits of Spinach Smoothie. 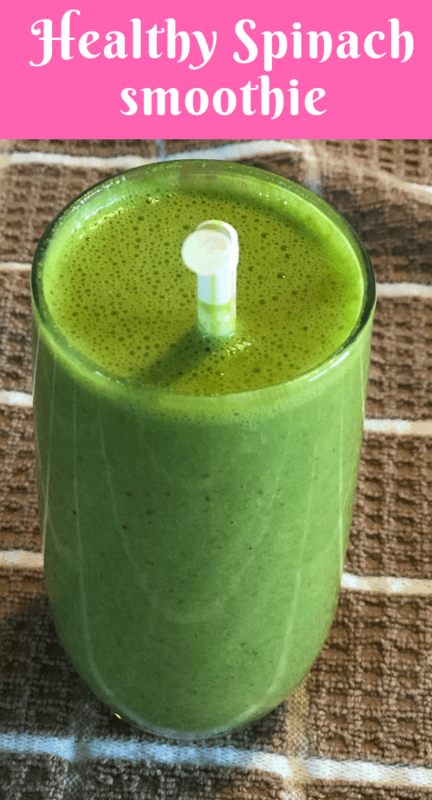 Spinach smoothie has powerful benefits for the body in several ways. Spinach has antioxidants that help to lower oxidative effected that constitute a significant cause of cancer. It reduces blood pressure. 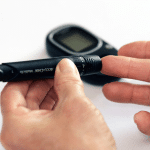 Moreover, it adds iron in your body and improves its blood glucose levels. This smoothie has flax seeds and cashew milk. Flax seeds are high in omega -3 fatty acids and fiber which can prevent cholesterol. Cashew milk is rich in magnesium, potassium and essential fatty acids. These nutrients are suitable for healthy skin and lowering cholesterol. A few months ago I was feeling unusually tired and dizzy. I frequently had headaches and would feel very cold even when it was warm. Well, I am always cold, but this was strange because I felt very cold and would wear a heavy jacket all day to keep warm.I did not know what was wrong. I decided to check with my doctor who found that my iron levels were deficient after running some tests. She put me on some supplements to boost my iron level and advised me to eat more green vegetables. I am still taking my supplements in addition to drinking spinach smoothie. Since then I have been eating more spinach in my salads and smoothies. I try to add spinach and other green vegetables to every meal each day. I take spinach smoothie every morning, and my energy level has improved. The dizziness I had is gone, in addition to that, I have less headache compared to before I started drinking spinach smoothie. My iron level has dramatically improved, and I am getting stronger. 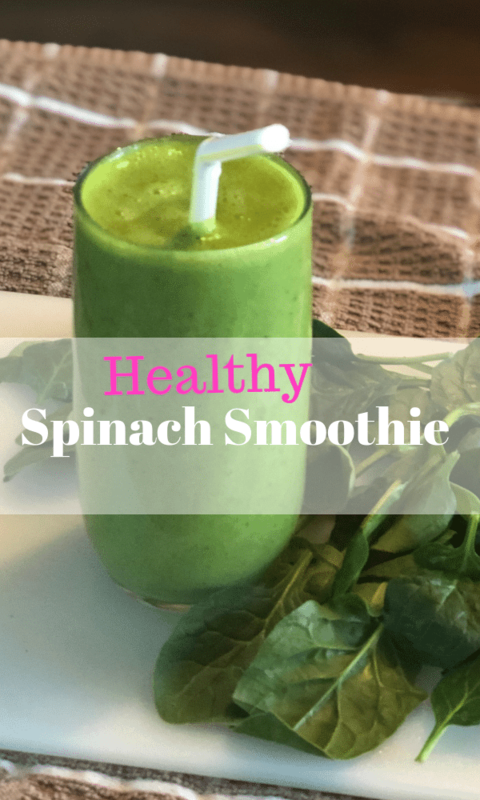 Spinach smoothie is good for detoxifying and cleansing of the body. I have drunk it for one month now, and my skin has dramatically improved. It looks more radiant and smooth. Spinach smoothie is easy to make. With a good blender, you won’t even realize you taste raw spinach. 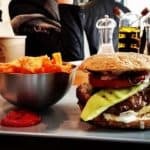 It blends very well with the ingredients and also tastes delicious even kids will like it. Put all the smoothie ingredients in your blender and puree to your desired consistency. After that, you can chill and serve your smoothie. Put all the smoothie ingredients in your blender and puree to your desired consistency. Chill and serve. Previous Post: « Witch hazel uses – 32 Extraordinary Benefits and DIYs.